If you operate a car wash or detail business, a great way to reach your audience — especially the younger generations — is the Internet. The Internet provides access to a broad range of information, services, and applications of the World Wide Web (WWW) including e-mail, telephony (VoIP), and file sharing. WWW allows for programs such as Internet websites and mobile phone apps. A mobile app is a computer program that is designed to run on a mobile device such as a phone, tablet, or watch. For example, most phones come with a map app that can be used to search for places and locations, make restaurant reservations, check real-time traffic conditions, get directions, voice-guided navigation, etc. 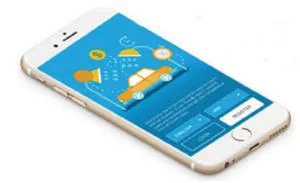 Shown above is an app created by v3cube.com that allows users to request and pay for on-demand mobile car wash and detail services. 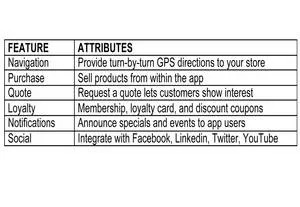 The table below contains some of the more common features and attributes of apps. Why is a mobile app important? Studies have shown that using apps has a positive persuasive impact on consumers, increasing interest in a brand and also the brand’s product category. Apps with an informative, user-centered style are especially effective at shifting purchase intention because this style focuses attention on the user and encourages making personal connections with the brand. This works primarily because of the high level of user engagement. According to the Localytics App Index, 34 percent of app users are highly engaged, and one third of all app users visit an app 10 or more times per month. Years ago, a considerable amount of knowledge and patience working with computer code was necessary to create an app. Today, business owners have better options. If you can work with templates and drag and drop, there are companies such as AppMakr.com or Appyie.com that provide DIY app creators that let anyone make their own iPhone or Android apps and HTML5 mobile formatted websites with no coding required. There are also companies such as Hyperlinkinfosystem.com that offer a suite of fee-based services and provide a finished product in two to three days. According to Maruti Techlabs’ blog, mobile app development is one of the most innovative and actively growing tech sectors with 179 billion apps downloaded per year. Consider Superoperator (SO), billed as the world’s first digital car wash network (www.superoperator.com). SO offers a turnkey solution for upgrading existing car wash chains into smart digital services as well as modern digital businesses. SO enables fully automated, always-open car washes that are operated by customers and controlled remotely online. There are no tokens, coins, or pay stations. Download the SO car wash application to a smartphone, look up the closest digital car wash, and drive to the wash.
Cars are automatically recognized at the wash bay, customers choose their wash program and never need to get out of the car or even open a window. In the United States, there are now several companies that participate in the SO digital car wash network. Arguably, car wash operators have something to gain by going mobile.